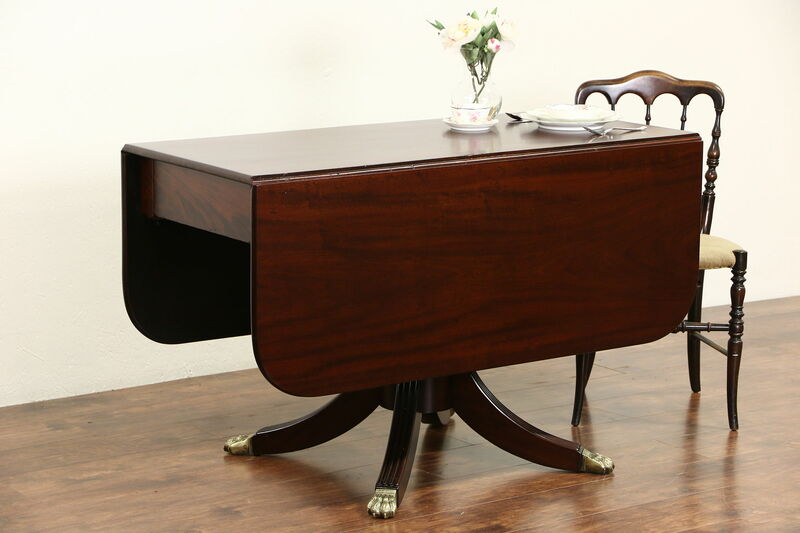 Hand crafted about 1825 during the Empire period, a solid mahogany drop leaf table is functional as a tea, breakfast, sofa or console table. The top and dropleaves are cut from single planks 22" wide. There are minor shrinkage separations from age and various restorations, see photos. The restored finish is excellent with rich antique patina. A classical urn column has a base with cast brass original lion paw feet. Leaves rest securely when raised on carved wooden hinges. Measurements when closed are 23" wide, 48" deep, 30 1/2" tall and legroom is 24" underneath, with both dropleaves raised width is 58" overall.